One look at Rosie and you can see the love and liveliness in her face. Rosie is just happy to meet everyone, especially if you have a kong or tennis ball to throw for her. 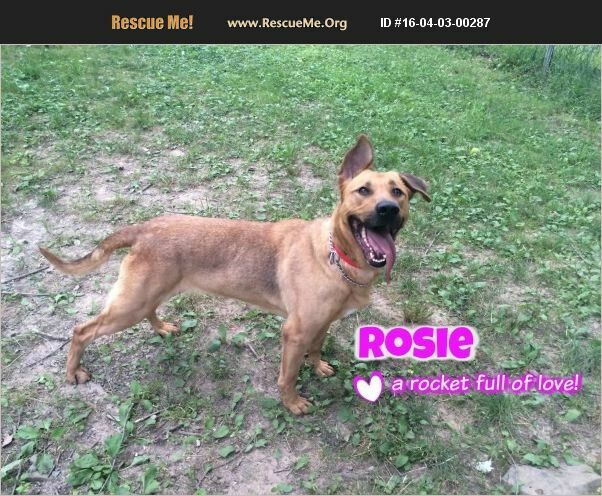 Rosie is about 2 years old and she is half American Staffordshire Terrier and half German Shepherd (this is confirmed by a DNA test). We call her a 'Rocket Full of Love.' Rosie can take off at full speed to fetch her toy then turn on a dime to rush back to greet her friends. Rosie has begun to receive basic training and is learning to sit patiently and wait for her toy or treat. She is a quick learner and eager to please. Rosie is very excitable around other dogs, and most likely would do best with someone that has no other animals. She does have a strong prey drive, so no kitties or small animals in her household. An active family would suit her just fine, especially someone with a large fenced in back yard.